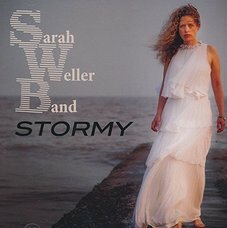 The Sarah Weller Band is new on the scene and is led by vocalist Sarah Weller who is a Perrier Jazz finalist but whether the term jazz is appropriate remains to be seen. The selection of songs on the album is a mix of newer and older compositions. The album opens with the title song which has a heavy rock beat which doesn’t bode well and is pretty forget able. “Slow Hot Wind” opens with a long boring guitar solo by Simon Golding who also wrote all the arrangements, it was a relief to reach the vocal which was a little better but does not really bring out the best in the song. Ivan Lin’s “ Love Dance” in another context may be considered a pretty good interpretation but as a jazz piece it is a non starter. As a non jazz piece “Hushabye Mountain” is possibly the best track on the album but it cannot be considered as a jazz piece. As a vocal “In a Sentimental Mood” it works quite well but the backing is entirely inappropriate. I am not sure what the two remix tracks are all about and thought they were something of a pop device. It would seem unfair to review this as a jazz release but it’s up to the public to make their choice.